Widespread adoption of internet enabled mobile devices that include smartphones, tablets, and laptops across iOS, Android, Windows platforms has led to significant paradigm shift in the productivity of the professional workers from enclosed business places to remotely cater to the daily business requirements. Furthermore, despite the proliferation of digitalization, enterprises are expected to continue to rely on printing for their business activities. Requirement to cater to the mobile workforce requirements in conjunction with extension of communication support with these mobile devices will continue to propel the portable printer market growth over the forecast period. According to survey conducted by Quorcia, around 70% of the organizations have witnessed at least one incidence of data breach owing to the mobile printing. Owing to the printing capability of these technologies from mobile locations, through any form of wired or wireless communication, mobile printing is faced with considerable threats from confidential information left in output trays of the printers. However, portable printers can be used to avoid these incidences, and the required document can be produced as per the requirements, regardless of the users’ location. This feature is expected to remain among the prominent growth driver of the industry. The global portable printer market was valued at US$ 464.7 million in 2016 and is expected to witness a CAGR at 7.7% during the forecast period (2017 – 2025). Online businesses that specifically include e-commerce, online food delivery services, grocery delivery services, and logistics have gained significant traction over the last couple of years, specifically in the emerging nations in Asia Pacific, and Latin America. These countries include Brazil, Mexico, China, South Korea, India, and AEAN countries. Along with the e-receipts, these businesses are faced with the requirement of on-demand barcode, receipts and label printing to cater the consumer requirements, which is expected to continue over the next few years and aid the portable printer market growth. Chief industry participants include number of players from Asian origin, such as Bixolon, Seiko Epson, and Brother Industries among others. Moreover, participation of number of small players from these regions in the international businesses, such as Woosim Systems, Printek, and Able Systems have led to significant reduction in the profit margins. Established players are under extreme pressure to differentiate their offerings to maintain their industry foothold. This is expected to drive the development of products with enhanced battery life, improved device management, payment capture, and seamless wireless connectivity to garner high consumer inclination. Moreover, establishing strong regional presence and strong distributor network to offer better consumer support, will be among the chief industry strategies for better future prospects. Portable printer finds significant application in empowering the mobile workforce to create printed documents, receipts, and invoices. This helps in enhancing the employee productivity while on the move, specifically in retail, transportation & logistics, and hospitality sectors. Moreover, portable printers help avoid security breach in enterprises, owing to which they experience significant demand from various end-use industries. The aforementioned factors are expected to propel the portable printer market growth over the forecast period. Increasing popularity of on-the-go printing and rapidly expanding mobile workforce are among the chief factors driving the portable printer market growth. Moreover, increasing popularity and requirement of mobile workforce to enhance the business productivity, streamline workflows, reduce downtimes at the selling point, and provide better consumer experience through their field services will present significant growth opportunities over the forecast period. For instance, retail industry, logistics, and other such business segments experience critical requirement for these printing devices as most jobs require on the spot transactions, receipt generation, tokens, shipment tracking, and shelf edge labelling for efficient inventory management. Thermal printing is an inkless means of producing hard copies. These are featured with optimum printing speeds, low print & maintenance costs, and are available in multiple compact models. Owing to the above mentioned advantages, it is expected to remain the largest technology segment. This report segments the global portable printer market on the basis of technology, output type, and end-use industry. On the basis of technology, the global portable printer market is classified into thermal, inkjet, and impact printer. Output type of portable printer include barcode, labels & ticketing, receipts, and documents & others. 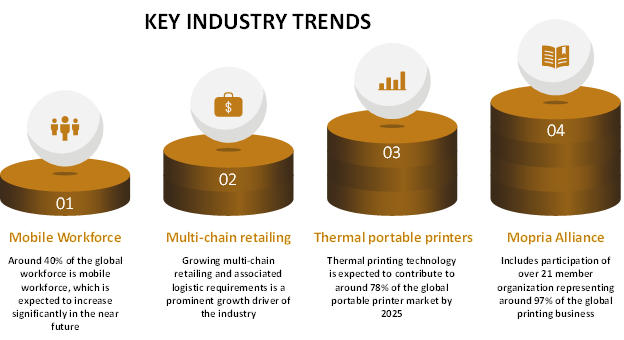 Portable printer market end-use industry segment includes retail, transportation & logistics, hospitality, manufacturing, and others. Key companies covered as a part of this study include Bixolon, Brother International Corporation, Canon Inc., Fujitsu Isotec Limited, Honeywell International Inc., Oki Printing Solutions, Seiko Epson Corporation, Star Micronics Co., Ltd., Toshiba Tec Corporation, and Zebra Technologies Corporation. *Browse 90 market data tables and 40 figures on "Portable Printer Market - Global forecast to 2025”.